Chapter 2 Incorporated is a one-stop shop, working directly with clients to engineer any project imaginable. Our engineering team worked closely with our client to meet our customer’s specific branding requirements and guidelines. Because of our wide range of capabilities, we were able to work with conceptual drawings to engineer and manufacture this nationally recognized fast food chain store front. Built with a steel structural frame and aluminum trim, the individual components of this store front were cut and assembled in our climate controlled facilities. Overall dimensions for the front are 20′ x 18′ and sides are 20′ x 20′ x 8″. We also assisted with any on-site installation needed. Our team created the structure by using an oxy-acetylene torch to cut both the structural steel and aluminum trim. Our welders employed both TIG and MIG welding to combine the pieces, as well as any bending and forming necessary. We then wet painted the panels in our painting facility and provided pre-assembly work for the fiberglass promotional panels. Project lead time: 2-3 Weeks. 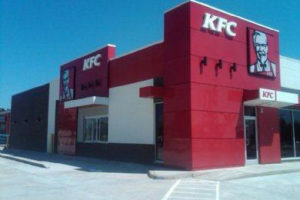 Product Description We manufactured this store front for use on the exterior of a fast food restaurant.